Launched in Berlin, with offices in Los Angeles and London as well, Moviepilot is a movie discovery and recommendation site of the highest caliber. Members of Moviepilot learn about new releases long before anyone else. Members are also able to discover new films and genres that align to their tastes through the platform. The newest offices, recently opened in Los Angeles, have been launched to devote resources towards both film and television. 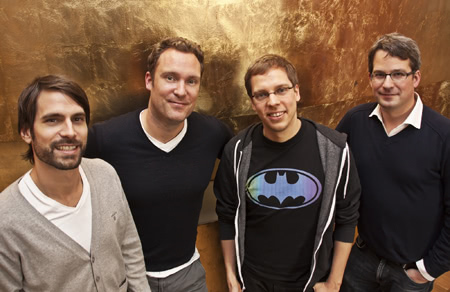 Cofounder Jon Handschin, who co-runs the ship from Moviepilot’s Berlin based offices, came up with the idea for Moviepilot after working as a film producer and a film distributor. His experience in the film industry has given him keen insight on how to bridge the gap between movie lovers and the studios. Is Moviepilot at a point where its users are directly influencing the output of film studios or filmmakers? We believe that moviepilot will be online what ComicCon is in the offline world: A place where fans raise their voice about their favorite projects. But not only limited to Superhero and SciFi movies but to all genres. Right now, the marketers of all major studios already have us on the map. If we succeed, then the producers and filmmakers themselves will follow soon. 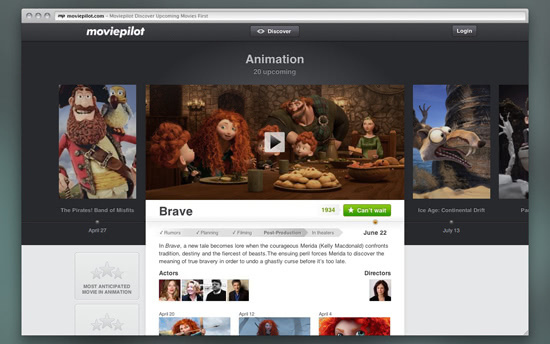 In what way has Moviepilot evolved since launch that wasn’t envisioned from the outset? My co-founders – Tobi Bauckhage & Benjamin Krause – and I sketched prototypes for nearly half a year before we actually began production of what was to become moviepilot.com. In the prototype phase the envisioned product still had dozens of different potential outcomes, but once we finally agreed on one route we stuck with it. Can you tell our readers how you went from a comfortable and promising position in the movie industry to launching a startup? I was a film producer. Then a film distributor, before founding my own internet company with my long-time friends and partners Tobi Bauckhage (CEO) and Benjamin Krause (CTO). But besides always wanting to have my own company, I also always wanted to stay loyal to my true passion, i.e. films and story telling. I think there are two types of entrepreneurs out there: Some that run companies because of the challenge of running a company and those who have a strong emotional connection to the topic they are dealing with in their business. Both have their advantages, but I will always be the latter. I think it helps a lot to understand your personal motivations before you start any kind of creative project in your life. What’s the extent of the market share you are currently reaching? 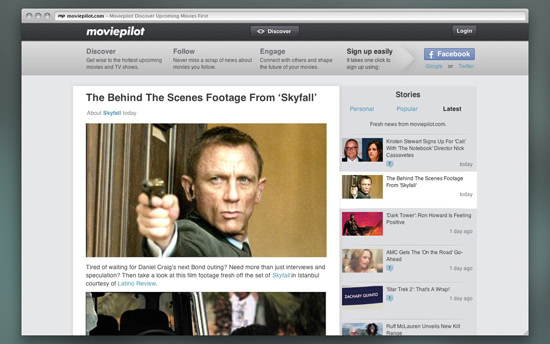 With Moviepilot.de we have created the largest film community in Germany. In the US we currently run 12 different pages that center around different topics and genres, from Superheroes to SciFi Fans to Horror Films. All in all, these pages currently have 10M Likes and they’re growing. So, as far as we know we might very well be the largest vertical movie community within the Facebook canvas these days. When you decided to launch Moviepilot, what was the best piece of advice you received? I came from the project-oriented world of movie making. The most stressful period of such a project is the 2 to 3 months of shooting, then you edit it and you are done. There is a defined time frame in which you finish each project, so in the beginning we assessed the task of creating an Internet company the same way. I still remember that our first power point presentation had a slide in it that said something like “Product finished.” Looking back now that should have been 6 months after launch, however, the truth is – a digital product is never finished. As long as you are committed in the company you must always iterate and improve. I remember our Angels pointing that out to us pretty clearly. What do you wish someone would have told you at the beginning of the process that might have made things smoother? Finding the right lingo between management and development staff certainly is a huge task. We had to learn our lessons of Agile development and scrum processes in order to find the right balance here. Anyone who wants to start an Internet company and does not have a brilliant CTO, like Ben Krause is for us, should definitely keep looking for such a person. In which of the three offices (Berlin, London, Los Angeles) do you currently spend most of your time and why? Most of the development, social media and the content team that works on moviepilot.com are still located here in Berlin. So Ben and I tend to spend most of our time here at the moviepilot HQ. Tobi moved to Los Angeles, where he pushes our international sales activities reaching out to the studio execs in Hollywood. What makes Berlin an attractive city for startups right now? Lets face it: Cheap living costs and great nightlife. No other European capital can currently compete with Berlin in the mix of these two aspects, which attracts an international crowd of talented young people. On the negative side one has to state that Germany is still lacking the financial ecosystem that Silicon Valley offers in the US. There is no Google, no Facebook, no Yahoo, but more traditional publishing houses like Holtzbrinck, Gruner & Jahr and Bertelsmann. Exit opportunities are smaller and so is the chance to become a serial entrepreneur. No wonder why so many of the new Berlin class start-ups try to focus on an international scope right away, Germany itself is just not rewarding enough. Do you have a favorite movie that was filmed in Berlin? “Life is all you get (Das Leben it eine Baustelle)” by Wolfgang Becker. The film came out in 1997, a year after I had come to Berlin. The time after the German unification is really well portrayed in the movie. If you had to recommend three to five movies that you feel are typically underrated or not widely known, which ones would they be and why? The Proposition by John Hillcoat. Great Australian Neo Western penned by Nick Cave. Arty in its deeper philosophical idea and still gripping with its bleak tense plot. Widely unknown at least here in Germany where it never made it to the movies but was released straight to video. The Firm by Alan Clarke – do not mix this up with the Tom Cruise Grisham vehicle. It is one of the best (maybe the only great) hooligan film out there with an incredible and still very young Gary Oldman in the lead role. Abre los ojos (Open your eyes) – by Alejandro Amenabar. This awesome mindbending thriller was later remade by Tom Cruise and called Vanilla Sky. Forget the remake. The Spanish original is witty, tense and emotional at the same time. What’s the best way for our readers to get in touch with you?